The following pages provide examples of types of primary sources, which can be published or unpublished and in any media format (print, audiovisual, digital, electronic). But keep in mind that primary sources are not easily categorized, so the following types are not all mutually exclusive. For example, photographs are listed as a specific type of source, but they can serve as either personal or institutional records. 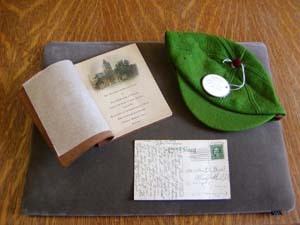 Leatherbound 1909 Commencement Program and Postcard from the Leonard H. Parcel Scrapbook, Record Series 41/20/169; Freshman Beanie, c. 1921, Artifacts collection.